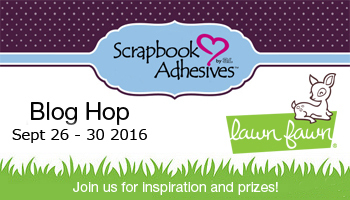 Welcome to Day 4 of our blog hop with Lawn Fawn design team! We are excited to share wonderful inspiration created with both company’s products. See what the two talented design teams have done. If you missed Day 3, click Blog Hop with Lawn Fawn – Day 3, for Day 2, click Blog Hop with Lawn Fawn – Day 2 and for Day 1, click Blog Hop with Lawn Fawn – Day 1. Don’t forget there’s an opportunity to win a giveaway…stay tuned for details at the end of the post! For my card today, I wanted something cleaner that showed off the cute little Ghosts in this fun Booyah set. I love how many options you get for dressing these guys up, but went with a bat this time since I used almost all the others on my project from Day 1 of our blog hop. I stamped the ghost and eyes image onto the white then popped up with our Crafty Foam Tape. I stamped, cut, & colored the ghost image, then popped it up with 3D Foam Squares- White, Regular. The sentiment is heat embossed and adhered to the green patterned paper using E-Z Runner® Permanent Strips Refillable Dispenser. Add a few sequins using our Dodz Adhesive Dots Mini to finish it off! To assemble the layers of card panels on the white card base, I used E-Z Runner® Ultra Refillable Dispenser (green cardstock and later, white cardstock) and 3D Foam Squares- White, Regular (patterned paper). 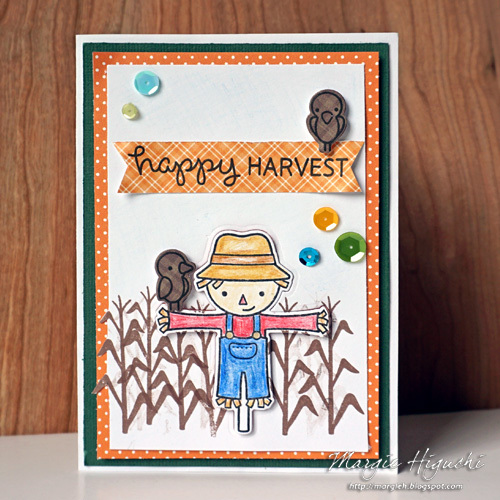 I stamped the scarecrow and cornstalk onto a white cardstock panel. Colored the scarecrow die cut and applied it (and crow die cuts) with 3D Foam Squares- White, Regular for dimension. Lastly, I used Dodz Adhesive Dots Mini to add sequins to the card. Blog Hop with Lawn Fawn – Day 4. This entry was posted in 3D Foam Squares, Adhesive Dots & Lines, Adhesives, Announcement, Cards, Crafts & Tutorials, Crafty Foam Tape, E-Z Runner® Dispensers, Fall, Seasonal Craft Ideas and tagged AJ Otto, Blog Hop, Card, E-Z Runner Permanent Strips, E-Z Runner Permanent Strips Refillable, E-Z Runner Permanent Strips Refillable Value Pack, E-Z Runner Ultra Refillable, Fall, Halloween, Lawn Fawn, Margie Higuchi. Bookmark the permalink. 31 Responses to "Blog Hop with Lawn Fawn – Day 4"
I love discovering new artists to inspire me when I hop along. AJ & Margie, your cards are fantastic. Super cute images and they would put a smile on anyone’s face! A great job! Very cute cards! I love A.J.’s idea of only one colored image. Wonderful cards..I love seeing the awesome inspiration and getting new ideas on how to use my stamps. Another great day of inspiration!!! Both cards are so cute!!! I love all your ideas ….thank you! Love AJ and Margie’s cute cards! I love using the 3D Foam Squares to add some dimension! So simple but it adds a great look! Lots of great ideas this week with fun projects! Margie and AJ I love both of your cards I like seeing both a Fall card and a Halloween card there’s a need for both tfs I love that boyah set unfortunately it’s out of stock but I put my name on the notify me list so we shall see! Using the right (and best) adhesives really does make all the difference in the quality of our projects, and I know that you carry only the best. I can attest to this because when I started out, I used other products that didn’t do the job. Thanks for providing us with THE BEST. I love the cards. They’re adorable! I’m so happy you have this blog hop since it’s a way to see even more projects! Love the cards! piece is colored. It’s a great look that I need to adopt. that little scarecrow is darling. I have to get him. What cute projects!!! Fave part of blog hops…..nobody is being completely honest if they don’t say that prizes are one of the best parts. 🙂 Thanks for the chance to win!! Love the cards! Thanks for sharing and for the chance to win! How cute. I really like the Harvest card. Love the cards today. Adorable scarecrow. BOO-tiful ghosts and SUPER CUTE scarecrow!!! Love both cards. The Booyah ghosts are great especially with just one as a bat. The Happy Harvest card is awesome. Love the crows! Great cards – love the dressed-up ghost especially! Bats and scarecrows and Autumn, oh YAY!!! My favorite time of year!! And these adorable cards are really getting me into the spirit of the season!!! Thanks for the awesome inspiration ladies!!! The scarecrow is super cute! I love seeing all the inspiration & finding new crafters and products!